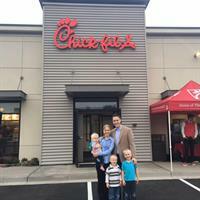 Vancouver's first Chick-fil-A restaurant opened on Sep 15, 2016 at the intersection of Mill Plain Blvd & 164th, bringing the restaurant’s signature menu of fresh, hand-crafted food, award-winning customer service and more than 70 jobs to the community. With dining room seating for guests, the new restaurant also includes drive-thru service for customers on the go and full catering services to bring its award winning hospitality to any location & setting. The restaurant, which offers free Wi-Fi, will be open Monday through Saturday from 6:30 a.m. until 10 p.m., serving a full breakfast menu until 10:30 a.m. Like all Chick-fil-A restaurants, it will be closed on Sunday.